2. Fireworks Fun: One year, I thought it would be such a sweet idea to take my dog to the fireworks display in Philadelphia – a “mother & son” holiday outing! We bundled up and walked twenty blocks to the waterfront, got ourselves a funnel cake and settled in right up front waiting for the fireworks to start. It was the most perfect moment. But after that first “pop!”, chaos ensued and I knew that I had made a terrible mistake. Noah frantically clawed at the ground trying to escape from those evil fireworks. I tried reasoning with him that fireworks were so fun and beautiful – he didn’t agree. We ended up walking (ok, he pulled me) the twenty blocks back to our apartment where he continued to cower and tremble until all the fireworks had stopped. So, please learn from my mistake. Although we consider our dogs and cats to be our children, this is one time when many pets would prefer to be left at home in their “safe zone”! 3. Party Pooper: If your pet is excessively scared of fireworks (I’m talking profuse drooling, shaking, refusal of all food or toys, trying to bust out of the doors or windows), you may want to talk to your vet about having some medication on hand to help get her through the evening. These medications are not miracle pills, and are meant to be used in conjunction with puzzle toys and positive encouragement. There are many different combinations of drugs that can be used in this situation – in my experience with dogs, anxiolytic drugs like trazodone are more effective than tranquilizers like acepromazine. It can take trial and error to find the perfect dose and combination of medications for your dog, so be sure to give yourself plenty of time for adjustments before the main event. 4. 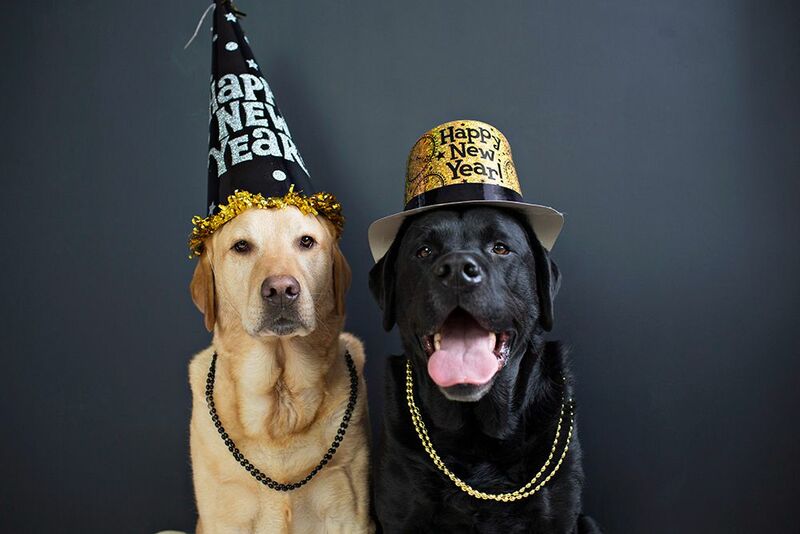 Raise the Glass: Believe it or not, your pet may try to participate in ALL of the New Year’s festivities! From counter-surfing the finger foods to sneaking a sip of booze, parties are the perfect time for pets to get into things that they shouldn’t. Let your guests know to keep the human treats away from the pups and kitties, despite those adorable begging eyes. We understand that accidents happen, so keep the number for the ASPCA Poison Control on hand in case you need it. If you don’t want to leave your pet out of the celebration as the ball drops, try some doggie beer like Spaniel Adams from Austin’s own YoDog Snackery. We hope that your New Year’s is tons of fun for you and your pets, and we’re thrilled to be bringing pet care right to you throughout 2017 and beyond! If you have any questions about vet care, or want to schedule an appointment to keep your pet’s health on track this year, please contact us. We'd love to meet you! What is your pet’s New Year’s Resolution for 2017? Send a photo to drjenna@vetaroundtown.com, and we’ll post them on our Facebook page!